This tournament was open to all players under the age of 18 years and attracted 43 youngsters from the ages of 8 to 17. 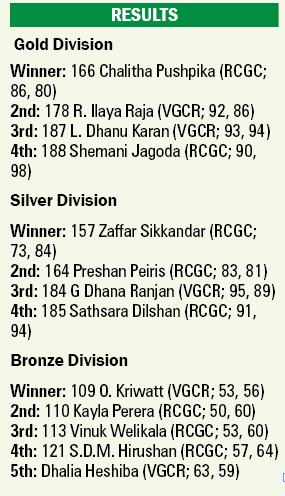 The Gold Division, which was the main segment of the tournament, for boys and girls between the ages of 15 and 17, was won by 17-year-old Chalitha Pushpika from the Royal Colombo Golf Club. He is also a member of the National Development Squad of Sri Lanka Golf Union. Chalitha was 12 shots ahead of his closest rival R. Illaya Raja from the Victoria Golf and Country Club. Chalitha had rounds of 88 and 80 for a total of 166. 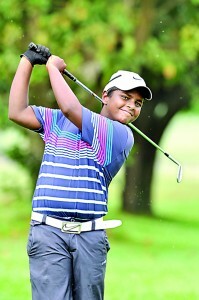 Fourteen-year-old Zaffar Sikkandar won the Silver Division by seven shots ahead of Prashan Peiris, who was on 164. The Bronze Division was won by eight-year-old O. Kriwatt from the Victoria Golf and Country Club, finishing one shot ahead of Kayla Perera from the Royal Colombo Golf Club. The tournament, which was organised by the Sri Lanka Golf Union, was sponsored by Prima.